OneDrive for Windows 8.1 shows you all the files in your locker—but they’re not necessarily all stored locally on your machine. If you want to make sure they are all synced and available the next time your Wi-Fi connection disappears, here’s how to do it. Any file you create on your PC itself is stored locally, but photos uploaded from a mobile device or documents created in OneDrive on the web aren’t synced by default—when you try and open these files in Windows 8.1, the data is grabbed from the cloud to complete your task. That frees up space on your local machine but it also causes problems if you’re out in the middle of nowhere, in an underground bunker or having issues with your ISP. In File Explorer, right-click on a file or a folder in OneDrive and choose Make available offline to sync a local copy. 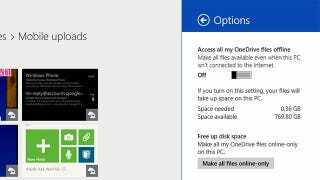 To turn on automatic downloading and offline access for all your OneDrive files, open up the full-screen OneDrive app (the Modern or ‘Metro’ version). Open the Settings charm, select Options, and flick the switch marked Access all my OneDrive files offline. You can see on screen how much this is going to cost in bytes. If you think this sounds unnecessarily complicated, you’ll be pleased to know Microsoft is changing the way sync works in Windows 10, so you’ve only got a couple of months to wait. The OneDrive client on Mac OS X works slightly differently, letting you choose which folders to sync from the Preferences dialog.